My buddy Kathi has reviewed the Paul & Joe holiday Eye & Lip Color Sets on her blog, Lotus Palace. Do check it out! According to the SA at Isetan Scotts, the Symphony collection will be launched in Singapore in early November (possibly around 8 November). 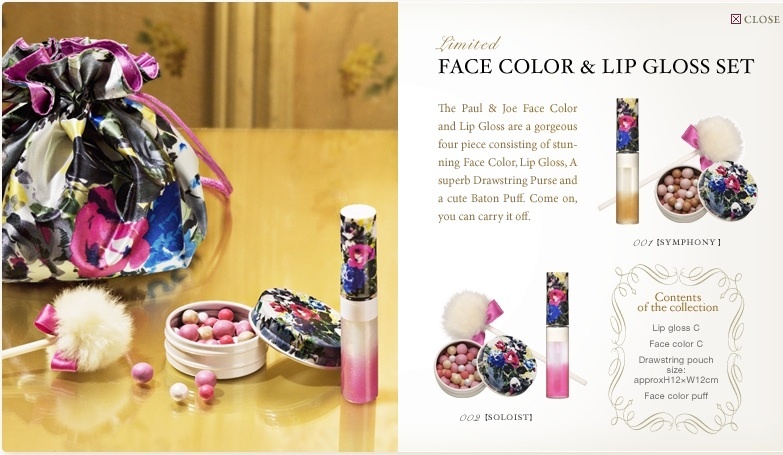 And the good news is that we are getting both the Face Color & Lip Gloss sets (shown above) with the face powder balls. Time to start saving up! oh yes! just heard that P & J has a sale going on at Taka! What do you recommend as their "must-buys"? I checked out the sale and the selection of products is very limited (lipglosses, the usual discontinued eyeshadow singles, some darker shades of foundations, moisturiser). For me, there were really no must-buys at this sale. Their lipglosses are good though. I don't know the release date for Japan as the P&J Japan website has not been updated yet. It should be sometime in November. You can try ASOS.com, which ships internationally and already has the Symphony collection in stock. I checked out Asos.com but they don't have the set with the face powder and lip gloss. I have to admit I like that more than the eye and lip kit which we are getting here in the States. thanks for the info, I'll just drop by and check out the face colours and glosses tomorrow. By the way, do you know if you can accumulate points with P & J at the sale? Nope, you don't get points for items purchased at the sale. Paul & Joe's membership system is also quite screwed up. They haven't had the membership cards for several months now. I'm still waiting for my card to be replaced and it's been at least 4 months. It's quite silly because it can't be that difficult to print simple membership cards. LOL... well stuff like this happens in life. I'm holding onto a temp card while a proper one was suppose to be mailed to me like 3months ago? If you like Majolica Majorca jeweling eyes, they're 30% at Watsons, and every $30 spent gives you extra 80 points, which converts to $4 off. I got BR793 Duchess and it really is much better than the last few collection! Hi Haru! I got 2 nail polishes and a lipgloss @the fair, as well as the Cat Vanity case from Taka counter @$36(40%off)! There's a P&J GWP with November Sweet that looks really nice! Are you getting it? I want to but i won't be able to head down anytime soon. I just bought the Sweet mag at Kino NAC. There were plenty of copies so if you go tomorrow, you should still be able to get it.